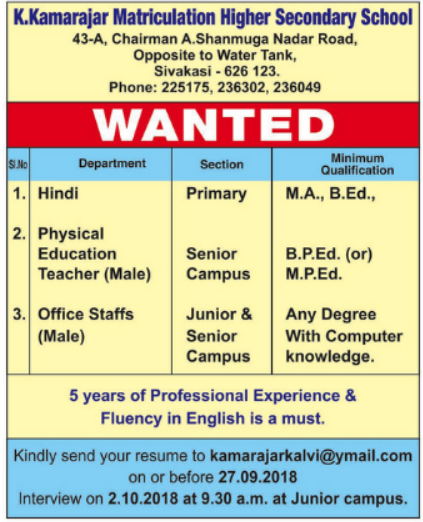 K.Kamarajar Matriculation Hr Sec School, Sivakasi has advertised in DINAMALAR newspaper for recruitment of Teachers RT / PET jobs vacancies. Interested and eligible job aspirants are requested to apply on or before 27th Sept 2018. Check out further more details below. About School: Our Institution is under the management of Sivakasi Hindu Nadars Uravinmurai Mahamai Fund Kalvi Paribalana Sabai. By the noblest dedication and excellent efforts of the excellencies of this Trust, Our K.Kamarajar Matriculation Higher Secondary School has grown into a reputed institution. How to Apply: Interested and eligible candidates are requested to send application along with CV, copies of certificates and recent PP size photos to the email address mentioned below.